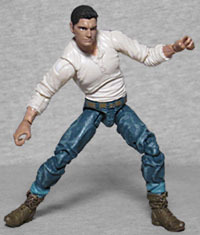 Although this figure is just called "Jack" on the packaging, Chapter 2 of the story gives us some slightly more specific info: his full name is Jack Lee, and he's part of the American ZST organization. Nothing ever says what "ZST" stands for, but "Zombie Strike Team" seems likely, doesn't it? And on a related note, it's interesting that this toyline, created and set in Hong Kong, seems to be relying on the old "America to the rescue" idea. Either the creators knew that they'd be selling these to a Western audience, and that we're pretty indifferent to any story where we're not the heroes, or they just legitimately like us. I prefer to think it's the second. Because I'm an optimist, apparently. Even as part of an American force, it's still possible Jack is of Chinese ancestry, and that being deployed into Hong Kong is sort of a homecoming for him. After all, "Li" is the second most common family name in China, and it could have easily been anglicized to "Lee" when his ancestors came over. Pop culture will survive with main characters who aren't white dudes. Jack is dressed like a catalog model doing a "camping" shoot: a white henley tucked into his blue jeans, and the cuffs of said jeans rolled way up so they don't cover any of his brown boots. You can just imagine him standing with one leg up on a conveniently placed tree stump, next to a coffee pot over a small fire, with a flanel tied around his waist and a tent in the background. Maybe the ZST is like the IMF, and they just scoop their operatives up from whatever leisure time activies they're engaging in when they're needed? 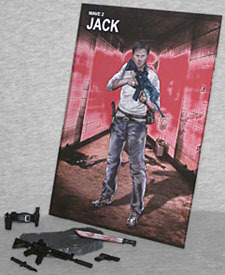 Jack Lee likes the woods the way Ethan Hunt likes cliffsides, but that doesn't make him any less of a badass. The Zombie Lab figures are built using the Vitruvian HACKS Character Kit System, so they have excellent articulation: a balljointed head and neck, swivel/hinge shoulders, elbows and wrists, a balljointed torso, balljointed hips, double-hinged knees, and swivel/hinge ankles. 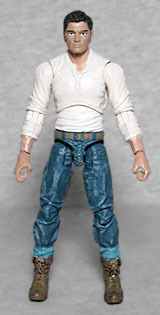 You can tell this is a first-effort line from a new toymaker, because the interior rings in some of the joints are the wrong color - Jack, for example, has white rings in his ankles, not brown. 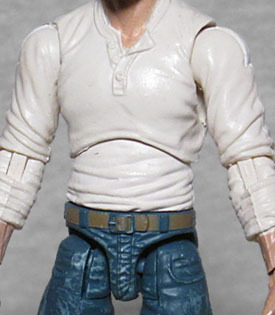 Yes, they'd always be molded in white (being done with the same plastic as the shoulders and elbows), but the factory screwed them on the paint apps, because Locker Toys Group didn't have the weight to throw around to make sure it was done perfectly. To show that this isn't just some plain civilian, Jack-Jack is loaded down with militaristic accessories. So many accessories that they don't fit in the tray! (Note: all the figures come in a standard tray, not one specifically shaped for them and their accessories; in other words, a big gap for the figure, and smaller gaps that any accessories can fit into.) He's got a machete, an assault rifle, a utility belt, and a pistol and knife that can be stored in the belt. Nice! There's also the standard display base, and the art card with the Chapter 2 story on the back. We've had the outbreak, we've had the rampage, but now we've got the first hints of humanity fighting back.